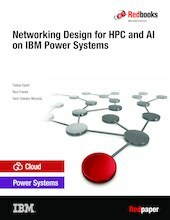 This publication provides information about networking design for IBM® High Performance Computing (HPC) and AI for Power Systems™. This paper will help you understand the basic requirements when designing a solution, the components in an infrastructure for HPC and AI Systems, the designing of interconnect and data networks with use cases based in real life scenarios, the administration and the Out-Of-Band management networks. We cover all the necessary requirements, provide a good understanding of the technology and include examples for small, medium and large cluster environments. This paper is intended for IT architects, system designers, data center planners, and system administrators who must design or provide a solution for the infrastructure of a HPC cluster.